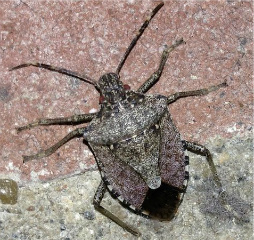 The stink bug is a common household pest. Their name implies that their most obvious means of defense against predators (and humans) is to emit an offensive odor--which, of course, discourages their enemies from handling or harming them. However, as a homeowner, their initial offense to you is not their odor but rather their mere presence inside your home. Stink bugs (sometimes called shield bugs because of their distinctive shape) are relatively easy to identify. Their color is generally that of a somewhat silvery-shading-into-dull-brown hue, pretty evenly distributed over their back. The underside is much lighter--almost a dirty pale white. The bugs are approximately 1/2 inch to 3/4 inch in length, with their legs prominently “splayed” outward and their antennae (about the same length as their legs) quite visible on the top front of their head. These features are easily observed when the bugs have alighted on the floor or on objects inside your home. However, the bugs are sometimes difficult to study closely due to the fact that they are often flying about the room and bumping into ceiling, walls, lamps, and whatever else is present--thus creating a visible and noisy nuisance. If stink bugs are present in your area, they often appear indoors as the weather turns colder--seeking shelter and warmth from the harsh outdoor elements. It doesn’t take a very large opening for the bugs to gain entrance into your home--just a small space around doors or windows, or even a partially-open or poorly fitted fireplace damper will give the little pests access to the interior of your home. Check closely, and try to seal off or caulk these possible entrances. Soooooo........how do we get rid of the little rascals? One method is to catch them individually in a jar or a plastic bag (calmly and carefully so as not to encourage the emission of their offensive odor), or to vacuum them up and dump the contents of the vacuum bag outdoors. Another means of control is to spray them with a mixture of water and liquid soap, and then to sweep and remove the dead bugs from your home. Neither of these methods will be a deterrent to the future invasion of more bugs, however. A better means of control, and a good deterrent to future pests, is a method tried and proven by my son to effectively eliminate the bugs currently inside the home and to prevent subsequent invasions of more stink bugs. Mix garlic powder with lukewarm water at the rate of approximately two tablespoons of garlic powder to each cup of warm water. Add the contents to a spray bottle and apply liberally around the areas where you think the stink bugs are invading your home (in our case, around the fireplace). Re-apply a couple of times a day for several days--and you should start to see fewer bugs appearing in your home. Not only that, but the ones you do see, should be already dead and ready for disposal into the trash or out the door. This ecologically friendly and safe method was quite effective for us. The main ingredient is rather inexpensive to purchase--in fact you probably already have some garlic powder on hand in your kitchen. Also, one possible bonus in using this method of pest control is that when you leave your home for awhile and then return, it smells like you’re entering an Italian restaurant! !